The other Siberian stopover on this trip was Tomsk, a city of about 600,000 people, located some 300 miles to the west of Krasnoyarsk. To get there, we flew on a two-engine turboprop operated by Irkutsk Air, another of the myriad successors to Aeroflot. As we boarded the airplane, we sagely noted the completely bald tires and an oil leak onto the tarmac from somewhere on the fuselage. As we took our seats, we were dismayed to see that the plane's interior was also in awful shape -- the seatbelts couldn't be adjusted, the carpeting was not attached to the floor, and no attempt had been made to clean the cabin from any number of previous flights. The filth of the plane surpassed my worst expectations. There was all sorts of debris that hadn't been cleared out. In the seat pocket in front of me, I found a half-empty bottle of beer. Al, one of the other people in the delegation (and who had the seat next to me), told me, "Don't get rid of that! I've got a feeling I just might need it before this flight is over!" But he didn't. In spite of its state of disrepair, the plane made it to Tomsk with no trouble at all. Upon arrival, I saw that the Tomsk airport was even smaller than Krasnoyarsk's -- there was just a single main runway to handle all the takeoffs and landings. That might have been enough, though; there didn't appear to be any other takeoffs or landings, at least during the time we helped the ground crew unload our luggage from the airplane. Inside the passenger terminal, there weren't many travelers' conveniences to be found. All this led Al to conclude, "I bet they don't expect too many visitors here." He was probably right. Like Krasnoyarsk-26, Tomsk had also been a closed city. Until recently, you had to have a very good reason before you'd be allowed to come here, and tourism wasn't one of them. Which is a shame, because there actually are some things in Tomsk that tourists would be interested in. One of them is a wonderful old cathedral, The Church of the Resurrection. It's situated on a hilltop in the center of the old part of the city, and with its multitude of golden domes it's a spectacular sight on a sunny day. The church is similar in appearance to the cathedrals I saw in Moscow, but here there isn't any St. Basil's to overshadow it. Another feature of Tomsk that doesn't have any equivalent in Moscow is the large number of wooden houses, constructed entirely from logs, that date back hundreds of years to the founding of the city. These are not the rustic log cabins of the North American frontier days -- far from it! 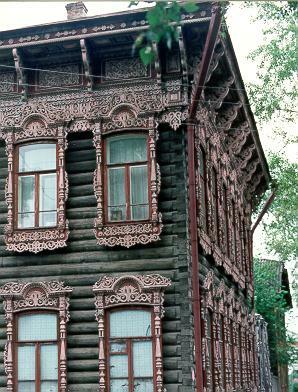 These are large, ornate houses, with intricate carvings around the windows and along the rooflines. They are truly a marvel, especially considering the number of Siberian winters they've withstood. Whoever built these spent a lot of time getting all the details right. Our Russian hosts in Tomsk also did a good job getting all the details right. Even though they were well aware that Tomsk is perhaps not the most exciting city in the world to visit, they made our stay there as interesting for us as possible, making sure there was time set aside for tours and shopping. They were also excellent dinner hosts; the amount of money they spent on food for us during our visit must have been enormous, which led Al to propose, in a dinner toast to them, that the money spent wining and dining us might have been enough to fund all the power generating projects that Tomsk would need for years to come! The very Russian custom of making long, involved, and entertaining dinner toasts was something that we all were expected to participate in, by the way. Without fail, every meal, including breakfast, featured bottles of vodka and imported French cognac. Without fail, at the conclusion of every meal, there was a round of toasts. We all learned pretty quickly to just take a small sip whenever there was a toast, instead of knocking one back each time. There were so many toasts that you didn't dare do more than that, a lesson that sunk in early on when Al made the mistake of trying to match our Russian hosts drink for drink one evening, and we ended up having to pour him into bed. Al, it turned out, was very adept and clever at making toasts, always having something entertaining to say. The one time I had to follow him, it was well past 11pm, and my mind was totally blank after a long day of continuous meetings. I had just about 15 seconds to think of something clever but the only thing rattling through my tired mind, due to some quirk of free-association, were limericks. I'm embarrassed to admit it was all I had, but sometimes you just have to 'goes with what you gots'. So I said: "Due to the lateness of the hour, I'll keep my remarks short. 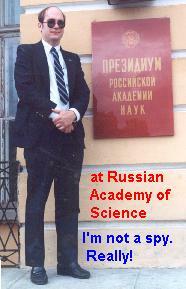 I really wanted to educate our kind Russian hosts in the fine art of the off-color limerick. But I see that I just don't have enough time. So I won't be able to tell you about The Young Man from Boston." I was starting to feel better about things now, so I continued: "I'm only too aware that things are really running late this evening, so I absolutely regret that there just isn't enough time left for me to tell you about The Argentine Gaucho Named Bruno." Moscow is not the city I'd choose as a travelers' haven, but coming back to Moscow after almost a week in Siberia was like moving into a five-star hotel after spending a week in a tent. We survived the four-hour flight from Tomsk (TomskAir this time) with no trouble at all; by then, we were so hardened to Russian air travel that we didn't even bother checking what condition the airplane was in before we boarded. If you were looking specifically for souvenirs, however, a much better location is a place known as 'Sparrow's Hill', on the south side of Moscow near Moscow State University. Dozens of souvenir vendors set up tables there almost every day that weather permits, and it was there I found many things to bring home with me. One very popular item that almost everybody was selling was the Matrushka, a brightly painted hollow wooden doll, that contained inside it a smaller, identically painted hollow wooden doll, which contained inside it yet another, even smaller identically painted hollow wooden doll, which contained inside it..... There were Matrushkas for sale there that had as many as 20 other wooden dolls nested inside. The price on those were pretty high, but bargaining to get lower prices was common. Many of the hucksters spoke passable English, and most of them took American dollars as well as Russian Rubles. It was three hours by air from Moscow to Frankfurt, then another eight hours from Frankfurt to Washington, D.C. I shared the flights with a large church group that had just had a big adventuresome trip of their own: two weeks in Moldova, another of the newly independent republics of the former Soviet Union. Like me, they had had their share of misadventures, and like me, they were more than ready to come home to The Land of Potable Water. But the lengths of the flights gave me a lot of time to think back over my experiences of the previous two weeks, and about what I'll remember from this trip. One of the things I'll remember is my realization of just how big the world really is. The middle of Siberia is a full 12 time zones away, the farthest from home I've ever been. It took three successive long-duration airplane flights to get there, which made it, for me, a very different, exotic, and even mystical place to visit. But it can never be that way again. The first time you visit a strange new place, it's an experience to treasure. The next time just won't be the same. The other thing I'll remember is my realization of just how small the world really is. The places I visited might have seemed exotic, but the people there were not; except for language differences, they were just like you and me. Many of them were memorable, but none more so than the precocious little girl who sat across the aisle from me on that surreal airplane ride from Krasnoyarsk to Tomsk. To her, the flight wasn't horrible at all -- far from it! She was very excited to be able to try out the English she was learning in grade school on me, and spent much of the flight doing so. 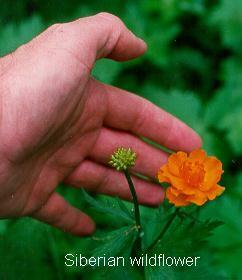 At the end of the flight, as the plane was bumping along toward the Tomsk passenger terminal, she gave me one of the golden rosette Siberian wildflowers from the bouquet she was bringing to her grandmother. When I gave her, in return, one of the Russia-America flag lapel pins we'd brought along, I got back her brightest smile. Our translator, who was watching all this from the next row forward, told me, "She'll remember you forever for that!"